Judo classes for schools in the Greater London area. Lloyd has been practising Judo for over 20 years and has been teaching for over 10. For the last 7 years, Lloyd has been teaching judo professionally at a number of schools in London and the home counties. Lloyd has a good rapport with young children and has the ability to communicate with children of all ages, thus making their judo lessons great fun. 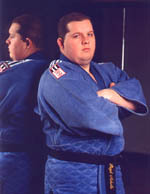 Lloyd started judo at the age of 10 years and very soon earned his first judo trophy in competition. Lloyd progressed into senior judo and has trained and fought at the highest level and has achieved a high level of technical ability.